For the country where only 15 per cent of its population have access to electricity, Nepal has come a long way. It took 84 years to achieve power generation of 250 megawatt. And only five years to add a whopping 125 megawatt through microhydels, an increase of 50 per cent. Since 1995, community-based power generation and distribution have ushered in a social revolution. Now Nepal's remotest hills generate their own electricity in their backyard. India, despite its vast hydro potential, chooses to ignore this clean and economically viable option. Sahashradhara, Dehradun, India. A soft drink shop greets thousands of tourists at this confluence of a thousand streams. So what's the big deal? Well, its just that the shop is located right inside a microhydel powerhouse that supplied electricity to three nearby villages for over four years. Two year ago, it suddenly stopped functioning. Its lone operator, Rajendra Prasad, has not been paid his salary ever since. He opened the shop for his 'survival'. His official register has the last entry in 1997, when a mechanic from Delhi visited the powerhouse. "Villagers have reverted back to their old kerosene lamps for light and children have again stopped studying at night," says Prasad. A bad example in a beautiful place. Piughar, Tanahu, Nepal. It takes a few hours of dangerous trekking at over 900 metres above the sea level to reach this village situated on a hill slope which overlooks the virulent Seti river. The last thing one can expect here is a hydroelectricity project. But local hillfolk teamed up, got a loan, and through voluntary labour used a stream for running a turbine which now generates eight kilowatt (KW) of electricity. Days now end late in Piughar. There is no longer that eerie silence that descends with dusk. The village is buzzing with life even at 10 at night. "We never imagined life would change so much with electricity," says Dhan Raj Gurung, a resident who has recently taken up off-season vegetable cultivation, irrigated by the tail end water of the powerhouse. A beautiful example in a difficult place. The two villages in the Himalayan range of mountains are separated by an international border, but more importantly by two different energy policies. In the Nepalese side, one can build and operate a run-of-the-river micro-hydroelectricity (less than 1,000 kw ) project as easily as a paan shop and can fix the tariff according to the cost. Implemented as a poverty alleviation and agricultural development programme, community-based electrification of rural Nepal has turned into a major civil society movement. "It is the most exciting social transformation," says Dipak Gyawali, a noted policy analyst from Nepal. On the Indian side, community-based electricity generation remains a distant dream. Though the Union government has opened up electricity generation to the private sector, regulation and inadequate policy incentives restrict the community, particularly in the hills where it is needed the most. 'Community participation' remains limited to few 'demonstration' projects. Says R V G Menon, director, Integrated Rural Technology Centre, Pallakad, Kerala: "The private sector invariably skims the cream and seeks to corner the most economically advantageous projects." This, again, leaves the remote areas without electricity. According to one estimate, about 40,000 villages -- mostly in the Himalayan range -- could not be linked with the national grid, despite their huge potential for generating electricity right in their backyard. Interestingly, Nepal had to bow before the pressure from its civil society to decentralise its hydroelectricity generation and distribution. 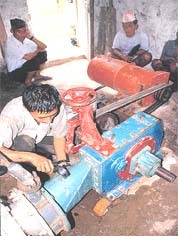 Here, the decentralised power policy was a result of the villagers and private entrepreneurs' effort to upgrade the traditional watermills for electricity generation. Acknowledging that the hills cannot be electrified with the resources available, the government delicensed power generation up to 1,000 kw . "That was a big leap forward in Nepal's decentralised energy policy," says Gyawali . India, on the other hand, has been ignoring mass movement of the hill people for decentralised electric generation and distribution. In the hills of Uttar Pradesh ( up) , some 50,000 such g harat (traditional watermill used for milling and husking purpose in the hills) owners are demanding to upgrade their traditional mills for electricity generation and for a community-based electricity policy. "When your rulers are blind, how can one expect light from them," says 70-year-old Inder Singh, owner of a gharat in Chamoli district, up . Three years ago, when Chija Maya, a resident of Piughar, spoke about a run-of-the-river microhydel power station in her village, many people thought that she was whistling in the dark. Though hydro-electricity first came to Nepal in 1911 to light the King's palaces, it still remains a dream for 85 per cent of its population; 90 per cent of rural Nepal is yet to be electrified. With help from undp 's Rural Energy Development Programme ( redp), Maya mobilised the community and convinced them about the electricity project. Villagers pooled in more than Rs 1 lakh (Nepalese rupees) and dug a 200-metre-long canal to propel the 50 kg turbines. "For us it was a major victory when we got electricity. Life has changed now," she says. To assess the spread of microhydels in Nepal, a visit to the Kathmandu Metal Industries, Nepal's oldest manufacturer of microhydel systems like turbines, can be quite fruitful. "Every month we get four to five microhydel installation orders and countless visits from people wanting to take electricity to their villages," says Akkal Man Nakarmi, the owner of the firm. He says at least one village decides to install its own powerhouse everyday. According to Nakarmi, the rush is in the 5 kw sector. "This suggests that villagers are also planning their energy policy, since above five kw is not suitable for a typical Nepalese village," he says. According to redp , Nepal's only national programme in the energy sector, by the end of 2000 Nepal would add 50 per cent more power to its capacity through these micro sets. For a country where only 15 per cent of its population have access to electricity, this is encouraging news. Nepal is the first south Asian country to privatise its power sector. 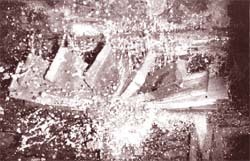 In 1985, it delicensed projects up to 100 kw to upgrade the ghattas (traditional watermills). In fact for this micro sector, the country's electricity department is not involved at all. Anybody can go for a hydro project by getting a loan sanctioned from the Agricultural Development Bank of Nepal ( adb ), which is extensively funding such efforts. The communities can also decide on the distribution and the cost of power. "Upgradation of the ghattas and the growing demand for the sets up to 5 kw, is the technological reply of the people to the challenging mountain electrification," says Nakarmi. Out of Nepal's 30,000 traditional watermills, 1,200 have been modified to generate over 3,000 kw of electricity. The government does not take any royalty or tax from these projects. Instead, it gives soft loans, subsidies and tax exemptions on electrical machines as incentives. "It is a social process where the community has snatched the initiative from the government and has now forced it to facilitate their efforts," says Urmila Simkhada, a Kathmandu-based social scientist. According to her, everyday a new history unfolds in Nepal's remotest villages with the advent of electricity. In remote areas, villagers are seeing their prime minister on the television screen for the first time. "The coming of electricity has changed village life," says Sunkumari, a community mobiliser with redp. 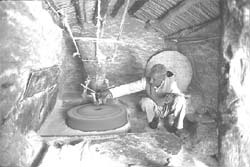 Women no longer spend hours for husking and milling; during the day, electricity is used for milling. "We save about four hours every day," says Sunkumari. Saving in time means more time to spend with children. "At night children study for more than two hours and their performance has gone up," says Maya. In Lamjung district of central Nepal, residents and the district development committee have invested in a company which aims to chart out an integrated energy plan for the district. This involves all forms of renewable energy, including community forestry, biogas schemes, solar photovoltics and small hydro schemes. They are also planning to sell the surplus power to the national grid. Though 85 per cent of Nepal's population do not have access to electricity, the abundant water resources always made an average Nepalese to dream about the 'hydro-dollars'. Nepalese have been fascinated by the possibility of generating electricity from the 6,000-odd streams and rivers. The 1970s oil crisis made this fascination for tapping hydropower into an obsession. After nine decades of Nepal's first 500 kw Pharping hydroelectricity project built in the Kathmandu valley to light the palaces, Nepal has been able to install only a total of about 250 mw hydropower, an average of less than 3 mw per year. From 1968 to 1975, there was a surplus of power as there was no infrastructure to consume it in remote areas. In 1977, the government decided to form the Small Hydel Development Board for supplying electricity to remote areas. It built 30 plants having a total capacity of 5.7 mw . But this was taken up only for the district headquarters and other politically earmarked areas. The project suffered from absence of market in the remote areas and a lack of a target-oriented policy. The board failed to deliver. In 1981, the ministry of water resources prepared a national development strategy "through the utilisation of water" and hydropower generation. The strategy clearly stated that as almost 60 per cent of the population live below the level of absolute poverty, small-scale projects and programmes should be taken up to directly benefit the rural masses and provide them with new opportunities for self-reliance. This brought the adb into the picture. The adb started funding microhydel projects in 1981 and now supports around 80 per cent of the microhydel projects in the country. Till now the units supported by adb generate 4025.4 kw of power through 1,000 units. In a network covering 60 districts, the bank has given Rs 21,900,000 as subsidy and Rs 35,100,000 as loans. Since 1993-94, it has handed over the management of 31 projects to these groups of farmers after forming them as cooperatives (see graph: growing power ). In 1984, the government was decided to delicense all electricity installations under 100 kw capacity. This led to upgradation of ghattas for electricity generation at night. It continued till 1985-86, when the government announced a subsidy on the electrification costs of the private installation: 50 per cent of the costs of generators and electromechanical parts (75 per cent on the remote areas). It made electrification more attractive and many sick watermills were converted for this. Also, exclusive power generation units came up. In 1985, it delicensed projects up to 1,000 kw . As the energy need in the hills is in kilowatt, and not in megawatt, villagers took the initiative to generate electricity. As an incentive, a subsidy of between 50-74 per cent is given, depending on the remoteness of the project location, for installation on the cost of electricity generating equipment and transmission system. A flat rate of Rs 7,500 per kilowatt is provided as subsidy on pole in areas designated as remote and Rs 5,000 for other areas in the country. Manufacturers of turbines and generators get tax exemption on the import of raw material. "During this time the government advocated microhydel projects and the private sector jumped into it," says Govind Nepal, manager, Intermediate Technology Development Group's energy programme. Nepal's tryst with 'hydro-dream' got a setback with the cancellation of Arun III (210 mw ) hydroelectricity project which ironically also opened the floodgate of community participation in the microhydel sector. The project on Arun river was backed by the World Bank and a consortium of donors. But there were protests. A group of Nepal's engineers, economists and journalists formed a pressure group, Alliance for Energy, to campaign against the project. Arun III was cancelled in 1995 and this triggered a public debate. While the government and the political parties made it their political plank to get back the project, the civil society pressurised for rural electrification as the priority and questioned the utility of big hydro projects which are installed to export power but not to electrify Nepal. It was the first civil movement in Nepal which forced the government to bow down and the World Bank had to beat a hasty retreat. "The realisation came to us: hydropower is not all about projects but about real electrification in the Nepal context," says Gyawali. "After the cancellation of the Arun III, there was a public debate on which mode of hydropower exploitation Nepal should take on," says Gopal Krishna Siwakoti, executive director of Inhured International, an ngo dealing with environmental and human rights issues. According to Siwakoti, the small hydropower sector was primarily the result of sustained pressure by the people, who had given up hope on the slow pace of big projects. "The cancellation of Arun III was a major turning point for Nepal and a big victory for the civil society asking for a suitable and sustainable mode of harnessing the hydropower. After the cancellation, the small sector got the right boost," says Gyawali. In fact, there was a sharp polarisation in Nepalese society on the lines of big or small projects after the scrapping of Arun III. "Political parties went for big projects as they brought in more money and more commission. While the people wanted small and decentralised electricity," explains Siwakoti. "After the initial government support, now it is the civil society which have taken the initiative. It happened so after democracy came to Nepal," says Govind Nepal. The cancellation of Arun III opened the way for private sector involvement and provided the much-needed space for a flexible and pragmatic approach. "The agitation over Arun III was Nepal's first civil society intervention, and privatisation is a result of it," says Ajaya Dixit, editor of Water Nepal , a journal on water resources development. "The small sector is a success as it started from the private sector and the government just recognised it by facilitating all the process," says Kamal Rijal, a renewable energy specialist with the Kathmandu-based International Centre for Integrated Mountain Development ( icimod ). "During this time generation of electricity was more of a honour than a commercial activity," says Bikash Pandey, director, Winrock International's (Nepal) Renewable Energy Project Support Office. Private entrepreneurs and communities had installed microhydel plants mainly for rural domestic electrification since grid extension is expensive for Nepal's remote and scattered Himalayan villages. There are also other strong economic considerations: the people's inability to pay for electricity, inability to generate revenue for maintenance, lack of capital, technical and managerial skills to establish and operate large enterprises. Microhydel schemes are, therefore, the appropriate option, especially since they use indigenously manufactured water turbines and generators. redp' s decentralised and community-based rural energy programme started in 1996 and has emerged as a model for other countries to emulate. It is also Nepal's only national energy programme. Starting from three districts, it has now been adopted in 15 districts. By the end of 2000, 60 micro hydro plants generating about 1,000 kw would be installed. This will add about 40 per cent more electrical power from micro hydro plants in Nepal. About 8,500 households will have access to electricity after the completion of these projects. Under this programme, the community decides, installs and owns the micro-projects through a community organisation formed for this purpose. The community organisation is a self-governing broad based institution. Besides rural electrification, it also looks after other community activities. "Energy would enhance the economic level of the people at the grassroots and enable them to come out from the subsistence level," says Shankar Sharma, a member of Nepal's Planning Commission (see chart: micro march ). The villagers first identify their energy needs and decide the site where the project would be located. The project is then placed before the village development council ( vdc) which screens the projects and makes a priority list to allocate the money. After another screening at the village cluster organisation called Illaka level Planning workshop, the final list is submitted to the district energy committee. At the Illaka level, financial resources from all sources are channelised. The district energy committee ( dec) compiles all the projects and list them in the annual energy plan which is sanctioned at the district development committee ( ddc) meeting. The ddc and vdc and the communities are required to share the cost: ddc and the vdc provides 10 per cent of the cost and the beneficiaries contribute 12 per cent, through labour and collection of materials available locally. Now more and more vdc s are giving priority to electricity generation and allocating money from their development corpus. Besides this, the community takes loans from the adb also. So the average contribution comes to around 30 per cent according to redp . The community owns the projects and decides its own tariff. Henning Karcher, undp resident representative, says, "The unique feature of this programme lies in the fact that it does not choose technology as a part of entry, but social mobilisation of the communities." "Once people are aware of the benefits, their participation is total," says Kiran Man Singh, programme manager, redp . "In the last four years we are recording more and more community participation in the microhydel sector," he adds. But there are some hurdles that threaten to jeopardise the spread of these initiatives. Water management is turning out to be a major issue in the hydel projects. Several of these projects have failed due to this conflict. Eight per cent of the turbine mills have failed due to riparian conflicts alone, according to a report icimod Report of a National Seminar on Mini-and Micro-hydropower Development in the Hindu Kush Region -- The Nepal Perspective . Usually, the traditional watermills do not create conflict but the turbine watermills have canals that divert water thus creating conflict between different interest groups like the farmers versus the electricity users. 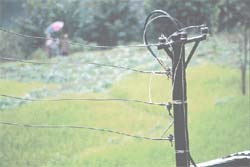 This conflict is more visible when the electricity users and the irrigation users are different. The Water Resources Act, 1996, prioritised the use of water resources, with the generation of hydroelectricity ranking fourth in order after drinking water, irrigation, and agricultural uses. The law doesn't specify any right of prior use of water resources for micro-hydropower projects. This caused the closure of a microhydel project in the Dhading district because the water that was used to generate power had been diverted for an irrigation project. This problem is more visible when the project is implemented by individual or a private companies. However, the government recently set up a district level water resources authority to solve these problems. Also, experts say that the traditional ghattas owners and the villagers using water for agriculture evolved a mutual system where water from a stream was used in a mutually agreed way. "With this and a bit more effort from people to settle their interests there should not be any conflict," hopes Man Singh. "The Local Governance Bill now gives the community all power over electricity, agriculture and irrigation. So the irrigation department is opposing it and sometimes the conflict also affects the hydropower sector," says Gyawali. A study published in icimod' s Renewable Energy Technologies A Brighter Future reported that out of 25 micro-hydro schemes analysed, 20 had overdue loans despite the fact that 19 had generated enough income to repay the debt. The study observed that five of the 25 projects, in fact, should be making money instead of loss but became economically unviable due to the competition from diesel mills. For diesel mills, the investment is less and easy to handle too. At present, surveys and designs are being done by the manufacturers to reduce the per unit cost. There have been cases when faulty design and location of projects have created problems for the smooth functioning of the project. "Manufacturers take care of the technical aspects but not the socio-economic aspects thus causing problems," says Govind Nepal. He says manufacturers push for sale. "Manufacturers are not accountable to anybody so there are lapses while installation," says Simkhade. If the subsidy which now goes to the manufacturers are restructured and passed on to the consumers, the users will show an increased interest, says Nepal. "Electricity has to be paid in cash unlike the fuelwood which comes free. So the question now is how to make it sustainable?" asks Pandey. As the world wakes up to a depleting finite sources of power like coal and the growing opposition to big dams, countries all over the world with water resources and difficult areas to electrify are opting for the community mode of electricity generation and distribution. "Today, a confluence of technological, political, and environmental forces is breathing new life into an old concept: decentralised, small-scale power," observes the State of the World-2000 report. As electricity has to be used locally to avoid transmission loss, micro-and mini-projects are the most suitable. Community participation helps in making the projects sustainable. Examples like Nepal, China and Norway reinforce that community management of micro-and mini-electricity projects have solved energy crisis in the most difficult places. In the Indian context the rural electrification programmes of China is relevant as it faced a similar challenge of electrifying vast inaccessible areas. During the 1960s, China realised that to electrify its remote areas (around 48 per cent of its total area) it had to evolve a separate energy policy for these areas. It adopted the now-famous 'self-construction, self-management and self-consumption' policy where the local administration owned and implemented small hydropower projects. The money came entirely from the local sources. Unlike India, the Chinese government limited its role to that of a observer. At the same time, it enforced technical standards and funded research into new technologies. The result was amazing: around 300 million people in rural areas got electricity through small hydropower stations they built and maintained. In 1975, only 50.6 per cent of villages were electrified. But in 1996, the figure reached an astonishing 94.3 per cent. China's ministry of water resources launched an energy-based poverty alleviation programme in 1985 to electrify 300 counties by 2000. They implemented small hydropower projects and fused irrigation and flood control works with electricity projects. Nepal without this integration is facing a conflict between agriculture and electricity interest groups. The rural decentralised electrification drive has helped China rid its rural poverty substantially. An assessment of 208 counties shows that economic development in these areas has far surpassed the national average. Also, the annual increase in gross industrial and agricultural output is 19.4 per cent higher than the national average. In 109 of all counties assessed, overall development of the local economy has improved remarkably with the coming of power. The per capita earning of farmers of these counties has doubled. To make these projects sustainable, profits are pumped in to generate more power. "China has crossed the stage of institutionalisation of its decentralised electricity generation programme. Now it focuses on better management of its power," says Kamal Rijal of icimod . Similarly, the rural electrification programme in Norway -- considered to be the oldest example of decentralised energy planning -- remains an example for other countries. Norway, with a vast remote and sparsely populated areas, started electrification in the beginning of the twentieth century and by 1930, 1,452 hydropower projects were generating 1701 mw . Out of these, 1,008 were of less than 100 kw capacity. In 1938, a public debate was triggered over hydropower being fully exploited for rural electrification. This resulted in parliament levying a rural electrification tax on electricity consumption for a rural electrification fund. This was followed by a landmark decision to decentralise generation. Local governments were empowered to plan, install and monitor small hydro projects. Local people were recruited in the projects and within years they became competent enough to run powerhouses. By 1965, Norway achieved 100 per cent electrification, with 99 per cent of the electricity coming from hydro sources. More than anything, small projects and decentralised management are seen as the practical solution to the impossible task of reaching to the remotest places through one grid. In Bhutan, where most of its micro-mini hydro projects were built and designed by Indian and Japan, users' groups have been handed over the projects for operation maintenance and for distribution. The communities are also empowered to fix the tariff. "In rural areas, the new technologies may allow the development of stand-alone village power systems, doing away with the need for costly grid expansion," states the State of the World-2000. In India, the Central Electricity Act, 1948, does not allow individuals, communities or cooperatives to take up electricity generation and distribution. Only a private company bound to sell power to the government can do so. Of course the company has to sell power at rates the government fixes. Since such rates are usually subsidies, projects become economically unviable. A joint study of India's rural energy market by the World Bank's Energy Sector Management Assistance Programme and the Winrock International observed: "It becomes clear that the biggest barrier to the commercialisation of renewable energy is political." Ask watermill ( gharat) owners in Uttaranchal, a solid body of more than 70,000, each a potential electricity producer. Convinced that the government grid could not reach them, they have been demanding that the gharats be upgraded and allowed to generate electricity for local use. "Our basic and primary need is lighting at night. And it is more important for the schoolchildren," they say. In up 's Chamoli district where the Chipko movement started, electricity is the last thing that the local residents can dream about. This, despite the national grid's omnipresent pylons. For months residents go without electricity and life comes to a halt in the evening. In Uttaranchal about 3,000 villages are yet to be electrified. Ironically, these are the villages with maximum hydropower potential. "Two small hydropower stations near our village are not functioning for the past five years," says Jayanti Prasad Matiyal, a resident of Gadora village in Chamoli and also the secretary of Chamoli Watermill Owners Association, formed to fight for rights to electricity generation through the gharats . Similar stories abound in India's 10 Himalayan states that have 70 per cent of India's total hydropower potential. Though the potential of small hydro projects is estimated at 10,000 mw, only 210 mw has been tapped till now through 267 projects. Rural electrification in India is a state subject and comes under the jurisdiction of state electricity boards. But the nodal agency is the Rural Electrification Corporation ( rec ) which implements national programmes through the state boards. By 1995, more than 85 per cent of the 580,000 villages were electrified. Even then, only 30 per cent of households can access electricity. There is desperation for electricity in rural areas and villagers are ready to pay for it, says Anil Joshi of the Himalayan Environmental Studies and Conservation Organisation ( hesco ), a Dehradun-based ngo . Highly centralised and heavily subsidised, conventional generation makes electrifying hill villages difficult. Centrally generated power may be cheaper, but transmission and distribution to these remote areas pushes up costs. Enter subsidies to maintain a low tariff: for the state electricity boards, a financial crunch. Chances of these remote villages getting connected to gridlines appear to be bleak. Government subsidies on conventional (non-renewable) source of electricity makes renewable electricity sources unviable. The share of hydelpower in the total installed capacity in India has been declining in successive plans. In 1967-68, hydro projects had a 46 per cent share in the total installed capacity, which has already declined to 24 per cent in 1998. Only one-third electric supply is consumed in the rural areas, despite the fact that three-fourth of total population is living in rural areas. "We are obsessed with the grid quality electricity and big projects," says Anil Joshi. "The government forgets that the remote villages remain in darkness despite their enormous hydropower potential." "These villages suffer from a system that insists on big projects and doesn't want to give up its control over the generation of electricity," says Anmol Jain of Rural Entitlement and Litigation Kendra ( relk), a Dehradun-based ngo . Says M Kannappan, the minister of state for renewable energy sources: "A country like India must commit itself to sustainable levels of generation and consumption of energy, so as to ensure energy to the future generation." He was speaking in context of the proposed new renewable energy policy that advocates community participation for rural electrification. In fact, only in the Ninth Plan, India for the first time focussed on a long-term energy policy. The proposed new renewable policy is an attempt to correct the past mistakes. The lack of political will to decentralise the power is evident from the experience of the agitating gharat owners in Uttaranchal. Since 1989, gharat owners have been demanding upgradation (see box: wheels of power ). Going by the estimate of the National Watermillers' Association, half a million gharats can generate about 2,500 mw of electricity, at the rate of 5 kw per gharat , and a cash generation of Rs 1,200 million per hour. Though the Indian government realises their potential, a political will to go for a decentralised generation is lacking. Of course, mnes does have some microhydel programmes, but they are just demonstrative projects. Despite the government's apathy, many states are realising that the community-based run-of-the-river hydel projects can do away with their power crisis. States such as Kerala and Himachal Pradesh have initiated their own version of decentralisation in power generation. In Kerala, under the people's plan, panchayats are giving more and more allocation for microhydels (see box: Southern connection ). "A state like Himachal Pradesh is 100 per cent electrified, but still there are many settlements on remote hills that still have to be electrified. For that we need community-based power generation," says Anil Kumar Kochi of Himurja, the state's nodal agency to implement renewable energy programmes. Himachal Pradesh is the first state to initiate tangible changes in regulations for involving community, ngo s and cooperatives in power generation. Says Prem Kumar Dhumal, the chief minister of the state: "Electricity being the basic need of the community, they should manage it. Despite legal hurdles, we will work towards giving them the right to manage it." The state government pushed through a landmark amendment to the Electricity (Supply) Act, 1948. With the President's assent to this amendment in April, 2000, the state is now ready for processing proposals from community or cooperatives of users. According to officials, there are already a dozen proposals from communities. As a part of its community-based electricity generation policy, the government has decided to upgrade the g harats by up to 3- 5 kw . Back to Sahashradhara. The thousand streams and as many reasons are reminders as to why the powerhouse was abandoned. But Rajendra Prasad is optimistic. "It would open one day," he says. Indeed. Sahasradhara's children can study at night, if only the example of Nepal's Piughar is emulated.